This essay is about a custom in English wikipedia. See also Meta:Snowball for Meta policy rejecting snowball closes on Meta wiki. If an issue doesn't even have a snowball's chance in hell of getting an unexpected outcome from a certain process, then there is no need to run it through that process. The snowball clause is not policy, but it is designed to prevent editors from using policies and guidelines as a filibuster. For example, if an article is speedily deleted for a reason not explicitly listed in the criteria for speedy deletion but it would almost certainly be deleted via the requests for deletion process anyway, there's little sense in undeleting it. Hell. 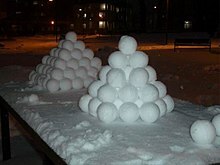 Note the complete absence of snowballs. An uphill battle is extremely difficult but potentially winnable. In cases of genuine contention in the Meta-Wiki community, it is best to settle the dispute through discussion and debate. This should not be done merely to assuage complaints that process wasn't followed, but to produce a correct outcome, which often requires that the full process be followed. Allowing a process to continue to its conclusion may allow for a more reasoned discourse, ensures that all arguments are fully examined, and maintains a sense of fairness. However, process for its own sake is not part of Wikipedia policy. This test can be applied to an action only after it is performed, and is thus useful for learning from experience. If an issue is run through some process and the resulting decision is unanimous, then it might have been a candidate for the snowball clause. If an issue is "snowballed", and somebody later raises a reasonable objection, then it probably was not a good candidate for the snowball clause. Nevertheless, if the objection raised is unreasonable or contrary to policy, then the debate needs to be re-focused, and editors may be advised to avoid disrupting wikipedia to make a point. When discussing community banning of disruptive user, who may have used several sock puppets and had vandalized articles, then if the result is clear from onset, the discussion can be closed as SNOW and ban enacted without waiting for flurry of pile-on support !votes for the sake of process. ↑ a b Clearly, the "hell" implied by this phrase is not the one envisioned by Dante. At the center of Dante's hell, a snowball might have a fine chance of surviving. For the purpose of this clause, however, Dante's hell is excluded. This page was last edited on 17 February 2019, at 07:39.